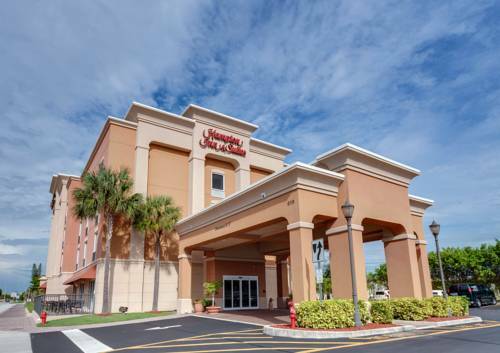 The beautiful Hampton Inn and Suites Cape Coral FL hotel is located in Cape Coral Florida south of Fort Myers and twelve miles north of Fort Myers Beach and Sanibel Island. We are conveniently located close to several outstanding golf courses the Minnesota Twin*s and Boston Red Sox*s spring training camps the Thomas Edison and Henry Ford winter estates white sandy beaches and a variety of restaurants. Our Cape Coral Hampton Inn hotel features 75 elegant rooms and suites in a luxurious Mediterranean style building. All accommodations are complete with refrigerator microwave coffeemaker iron and ironing board complimentary local phone calls data port with high-speed internet access and cable TV with complimentary movie channel. Sure to please the busy executive or leisure Florida traveler Cape Coral Hampton Inn hotel guests will enjoy complimentary On the House hot breakfast buffet served daily. Guests will also have access to our outdoor swimming pool fitness room business center and wireless and wired high-speed internet access throughout the hotel. We love having you here in Florida at the Hampton Inn Cape Coral hotel. ~56 miles from Cape Coral. ~48 miles from Cape Coral. ~61 miles from Cape Coral. ~68 miles from Cape Coral.